According to Osteoporosis Canada, fractures from osteoporosis are more common than heart attack, stroke and breast cancer combined. Popular belief is that women are primary sufferers of osteoporosis, however both men and women of all ages are susceptible. Osteoporosis is a bone disease characterized by decreased bone mass and deterioration of bone tissue. It is often referred to as the ‘silent thief’ because it occurs without symptoms. Over a period of time, bone becomes thin and porous, which exponentially increases the risk of fracture. The most common sites for these types of fractures are at the wrist, spine, shoulder and hip. 1 in 3 women and 1 in 5 men experience #osteoporosis related fracture during their lifetime. Learn to prevent them. Since peak bone development occurs during childhood and adolescence, the ideal way to prevent osteoporosis is to participate in bone loading activities during these years. That being said, bone deterioration is inevitable with age, thus participating in active living throughout one's life is necessary to both prevent bone deterioration and preserve existing bone. Post-menopausal women are at a much higher risk due to the reduction in estrogen. They lose bone density at double the rate of men and pre-menopausal women. Studies have shown that consistent strength training can help prevent further bone loss and perhaps even help build new bone. Thus, it is vital for all people to participate in resistance training exercise. The most comprehensive way to prevent or deal with osteoporosis is to participate in five components of healthy living: weight bearing exercise, strength training exercise, posture training, balance training, and stretching. Individuals with a greater risk of fracture may modify the five components to their level of fitness and/or severity of osteoporosis. Weight bearing exercises are ones in which muscles and tendons pull on bones causing a stimulation of bone cell reproduction with the assistance gravity when the body is upright. These activities include walking, running, aerobics, dance, various ergonomics, as well as sports such as, basketball, tennis, soccer, etc. Individuals who have a greater risk of fracture due to osteoporosis may need to perform lower impact weight-bearing exercises. When in doubt, start low and slow. Strength training incorporates weights or some form of resistance (i.e. exercise bands) which cause bones and muscles to work by lifting, pushing or pulling the load. Strength training increases muscle mass and muscular strength which increases bone density, thus preventing fractures in the future. Posture exercise help maintain good neck, back and shoulder positioning by aligning the spine. By simply sitting and standing with a straight back and shoulders retracted one can help strengthen the upper posterior chain muscles. This will help maintain good balance, thus preventing one from falling and fracture their bones. Balance exercises also help improve one’s coordination. Exercises that include the back muscles as well as hips assist with maintaining proper posture. Balance training is a low impact activity that may not maintain or build bone density, but it improves stability and body awareness to decrease the risk of falling when the body is jostled suddenly like slipping on ice or being bumped while walking down the street. 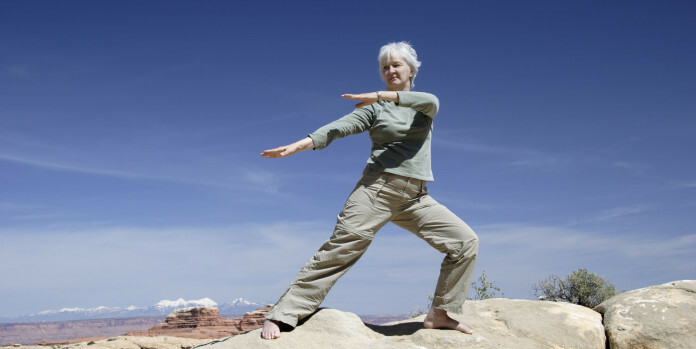 Tai Chi and Yoga are good examples of activities to help improve balance. Stretching is important to maintain flexibility around joints and muscles. Due to the nature of aging, we lose flexibility which causes pain and stiffness, which leads to a decrease in activity. When we are constantly in pain or feeling stiff we opt out of physical activity, which eventually leads to a decrease in bone density. Therefore, in order to feel capable and competent in keeping active, it is vital to maintain good flexibility and range of motion in joints. It is never too late to start a bone healthy exercise program, regardless of your osteoporosis status. By regularly participating in an exercise program that incorporates all 5 components, you can help prevent falls and fractures, as well as preserve existing bone. Lifemoves focuses on developing comprehensive exercise programs tailored to individual needs in order for people to live healthier, stronger and more active lives. Book a free consultations with one of our Kinesiologists. Great Work and great information you’re sharing here. Your blogs are really helpful.